In this episode, Harold Reitman, M.D. speaks with Lori Bitar, educational consultant and author of “SOS: Save Our Students.” Lori has a long history of teaching students with all forms of neurodiversity- from autism to ADHD to dyslexia. Lori discusses her history in the educational system, the inherent gender biases that are common in teaching, and what direction she feels society needs to move in to maximize performance. Also, check out the blog Lori wrote for Different Brains here. 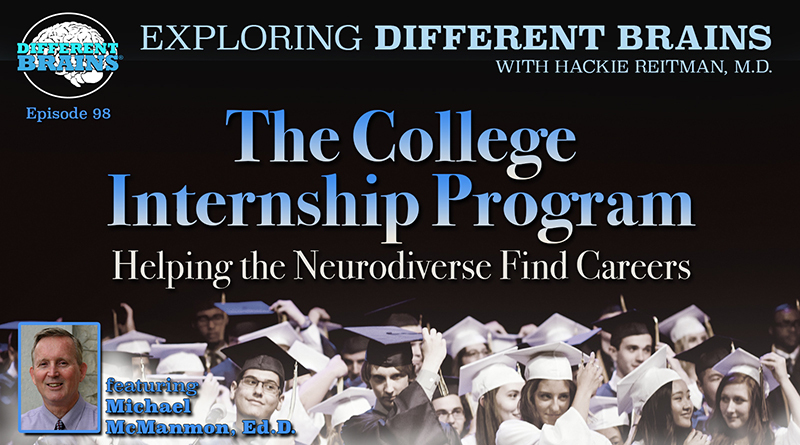 HACKIE REITMAN (HR): Hi I’m Dr. Hackie Reitman, and welcome to another episode of Exploring Different Brains. Today I’m very excited because something that doesn’t get discussed enough in America, education, we’ve got Lori Bitar who is an educational consultant, was a teacher of the year, was nominated Disney awards in teaching, and she’s the author of the book, SOS: Save Our Students. We need to look at our educational system, Lori welcome. HR: How did you get into education? LB: Well all of our journeys take us in different paths, my mother was a teacher and my grandma was a teacher and I certainly swore to god I was never going to be a teacher after I saw them struggle through trials and tribulations. HR: where did you grow up? LB: I grew up in Illinois, a small town called Quincy about an hour and a half north of St. Louis. So I had the Midwest and the farming and community in my first chapter really goes into what my journey looked like. And I tried psychology and I tried addiction specialist and I tried a bunch of different career hats on and none of them really fit. HR: Well why you wanted to help people? Is that why you tried all those different things? HR: So you knew you had to help people you you just didn’t have the vehicle so you tried all these things, how’d you get into teaching? LB: At the time in the career path it made sense to pick up teaching as a way to use the tools I had learn in psychology and the treatment centers where I did internships. To put things together to really help kids in different way. So my whole model of teaching came out of therapeutic background, wrap around services, it came out of that model then the academic piece. I spent that extra year getting those pieces in check and I came straight to Miami and started my career. HR: What was your first teaching position? LB: My first real teaching position was at North County elementary in a third grade classroom and I highlight several of the stories of the first baptism by fire teaching experience. The kids really had a lot of needs, more problems then I could have ever comprehended and I just taught hard and fast and did everything I could to try and make an impact. HR: What do you feel is the greatest challenge in our education system today? LB: I would have to say the ability to meet the kids where they are is probably the biggest challenge where everybody faces, whether they’re financial constraints whether their emotional constraints, facility constraints, but being able to meet kids right where they are and provide them the support they need is probably one of the biggest challenges. HR: When you say right where they are, you’re talking about how their brain works? What are you talking about? LB: I’m talking about everything that makes that child who they are, their environment, their heredity, their brain, their learning style, their energy, their emotions, everything that comes together that way. HR: So you’re basically saying what we’re saying here at differentbrains.com one size does not fit all. Now in your suggestions for teaching, what are the logistics for that in teacher, the logistics of meeting the student where they are and how do they do it? What would you like to see changed? I just remember once I was principal for a day in Hollywood, Florida. Went to a middle school and I love-asking teachers, I love asking anyone in a different walk of life, what’s the single thing about your job that a guy like me would have no idea. They told me, three different teachers that it was I’m not just a teacher, I have to be the social worker, I have to be the parent, I have to be everything to these kids because many of them don’t have any support, What’s been your experience that way? LB: Well I would have to concur, but I would change the language just a bit. Over the years, it was challenge, it was difficult to meet kids right where they were, but I didn’t have to be the parent, the way I see it is I get to be their parent, I get to be their social worker, and I get an opportunity to suit up and show up for that kid every single day because no body else can. So I think it’s an honor a privilege and a real hard shift for a lot of folks, but that’s part of what my book is about, you have more power, you are a super hero and it only takes 5 minutes of your life to change the entire trajectory of a child’s life, it may not happen right away but every single day that you meet them where they are and you meet them at the door and you hug them and love them, and give them that good start you have the opportunity to change their entire trajectory and it does matter. HR: Very well said. You know I’ve had the opportunity to meet leaders like Temple Grandin who says her whole trajectory was changed by her science teacher for that one teacher, certainly we see over at the boys and girls club of broward county where we serve 13,000 great kids, many of them don’t have support at home don’t have great parents and were very proud we have a high school graduation rate of about 90 percent where a similar demographic in the county is about 36 percent in some areas. What we have to do is figure out how do we make the Lori Bitar method the prevalent method? How do we go about it? What steps do we take as a society to do that? LB: Well I’ve given that a lot of thought and it’s really hard to articulate that in few words, but the one thing I know with the new laws that have passed the powers that be have started to understand that social emotional learning is powerful stuff and they want to use it as measure to school grades and school grades moving forward, they’re not really sure how yet but the one thing I know about standing in that classroom in the moment every single day, running my charter school with all of my kids and all of their pieces I think the most important thing I can do and I want to do is train teachers in how to care for themselves. Because when they are learning to use the social emotional skills they may have not developed then they can teach it. But you can’t give away something you don’t have. And you learn to care for yourself and you learn the social emotional skills that you need self management self regulation responsible decision making as an adult you can articulate that and not make all the mistakes that I made along the way, I think that whole philosophy and opportunity makes that shift from I have to be a parent to I get to be their parent. HR: The glass is half full. HR: What can you tell our DifferentBrains.com audience in your educational consulting and teaching and running a charter school and all of your experience, the difference between the male students and the female students if any? LB: That’s a great question and I probably could not have answered it if I was not a parent of a son. My 19-year-old son taught me a lot about things I could have never learned any other way. When I went into the classroom with male and female students I try to take off whatever glasses I had and see them who ever they were wherever they were and meet their certain needs, my son taught me definitively at least in his case, that heredity in a male causes them to run like a motor, my son ran and when I had my tutoring company it was just constant I’m running I’m running, I’m going I’m going, very active, and I would watch as we went to events and watch little girls sitting and coloring. I would just think wow; my son could or never would do that. But they still got to the same; they just do it in a different way like your viewers already known and understand. 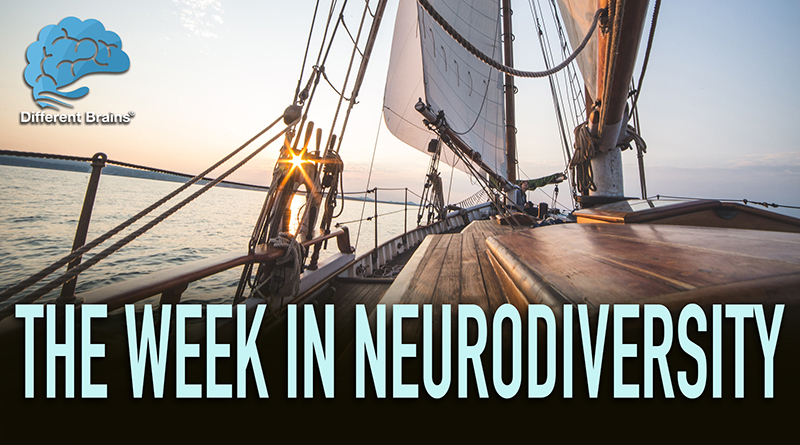 HR: What role does neurodiversity play in your world? What role does different brains in these students play in your prism to look through? LB: Well I always joke that probably for the first 10 years I was a great motivator, we didn’t have data we didn’t have measurements we taught hard and fast, we called it spray and pray and hope they get it because we really didn’t know what they needed so we used what we liked as teachers, we decided we were going to do units on things like that, as we’ve evolved and as we’ve grown both in science and education we found that being able to measure some of their learning style, being able to diagnose their strengths and weaknesses, gives us a better shot to provide the services and the specific gaps that they may need filled. As I read your book, Aspertools, and I watched how you put those things together with your daughter I could see very clearly that being able to observe and collect data whether its anecdotal or formative or sumative, helps us really frame and support those students whatever they have to offer, in my book I’m a super hero and the students are the side kicks, and fight the arch enemies of education, poverty, gangs, special ed services, ADD, each of those students I tell their story and the life they were living much like your daughter was able to do with you and your book and I talk about all the crazy mistakes I made and I made a lot of them, but over the course of time the kids and science and data and a lot of different things helped me understand better on how to find the resources on whatever topic I was talking about. HR: Now if our viewers want to find out more on you our your resources and your methods and everything, how do they do that Lori? HR: How do you spell that? HR: That’s great, what might they find at loribitar.com? LB: they will find books, products, services, information, and just a lot of validation that if they’re looking at things much like you are in different brains and not one size fits all, they’ll find a lot of validation that they’re on the right track. HR: Lori how do you see today’s generation of teachers versus twenty years ago? How do you see them? LB: Well probably if I thought a lot about it, the young teachers I work with, because they’re digital native and not digital immigrants like us old folks they’re able to navigate change a little bit quicker and a little bit easier with I’ve been in thousands of classrooms and those young teachers seem to navigate change but they’re also able to differentiate and meet the needs of their kids a bit better because of their ability to access technology. They’re able to access programs like class dojo and click kids behavior and give them that immediate feedback and to let them know they’re on track and they encourage and support where as we had to do that in the old days with paper and pencil and was difficulty to navigate change as quickly as the new teachers are able to do. HR: We’re learning more and more that females Aspies, many whom I’ve met personally and who are leaders in many different fields, I’m finding that they’re teaching me that their diagnosed much later, and they’re given me various reasons for that they’re able to go undiagnosed its interesting what caught my ear when I was asking the difference between the male and the female students was that the guys are more aggressive and of course we’re generalizing, I apologize to anyone for generalizing, if you’ve met one Aspie you’ve met one Aspie. If you’ve met one anything you’ve met one anything. Today we’ve met one Lori Bitar who is a unique individual. I would like to delve in a little more while we have you here because we have your prism here, which is a different lense to look through. If you could give any more detail from your point of view about female teachers vs. male teachers, female teachers vs. male teachers female students vs. male students. I want to hear from your point of view because you know what you’re talking about. LB: Well looking at just teachers into he field, male vs. female, we don’t have a lot of male teachers. We don’t have a lot of male teachers, we have male administrators but we don’t have many males who stay in the classroom. When I’ve had an opportunity to look at what’s effective and what’s best practices in teaching it usually comes down in sense of understanding the emotional needs of kids and willing to do whatever that looks like. For example I see a male teacher who gives a special handshake much like a basketball coach, I love to be able to do those things. I’m a female. I think a lot of things that have come together over the years have a lot to do with what we as adults perceive the kids, we say oh you’re a girl you might not be good at math and science but we know you can write. So we already pre programmed and pre conditioned some of those things even with out knowing, the educational research they actually watched in a match class, back in the 60s they video taped in that point the teacher and they watch who they called on and how they called on them and again collecting data, data doesn’t lie especially when it’s on a video tape. The teachers who inherently or naturally call on the boy student during math and they would naturally inherently call on the female student during language arts. HR: How long have you been teaching now? LB: Well I started in 1991 down in Miami. So it’s been quite a ride behind tutoring services, charter school founder, consultant, teacher, everything I could think of how is my gift best used. HR: Can you tell us more about your charter school? LB: Yeah I can, I’d be happy too. I had left the public schools a couple times because I was frustrated that I didn’t feel like we weren’t meeting the needs of kids, It felt bureaucratic, the kids what they weren’t needed was not being met. So I started a tutoring service back in 1997 and I was able to impact kids in a different way. After the 9/11 tragedy the economy shifted and changed and some folks approached me at that time to write a Charter and I said wow I’ve never really thought of that. So I sat down with a consultant and put a charter together but in my way the Charter was going to look like the way that it should. So I was head of legislation, I did learning centers in middle school the grades and formats five years later oh you should do these kinds of things, I offered computer based education to my gifted kids so they were able to access a high school curriculum, put everything together in middle school charter school. Where we had hands on learning, therapeutic interventions early in the morning we had titan town hall. We would have the kids call each other out for positive things. It was really empowering and really engaging and the team and I really built a strong foundation that in 2005 we won the governors top 100 middle school awards in achievement in an at risk population with many kids who had been diagnosed either special ed or had a 504 plan to help meet their needs, so it was a really exciting time and a great opportunity for me to figure out how smart I really wasn’t and in the mean time I worked a little bit, too hard 17 hours a day, 7 days a week and my health couldn’t maintain a long-term commitment to that but it was a wonderful opportunity and several of the students from the school are in the book and they’ve interacted and talked about the experience and how impactful and as I planned my book launch activity many of the students were going to attend and bring everything together. HR: Who should read your book? LB: That is the million-dollar question. I have sent it to lots of folks and had multiple people in different industries read the book. The reality was that each and every time the focus group came back and said everybody should read this book. But I’ve also tried to listen and where it could be the most impactful and I think that starting with teachers and foster care workers and afterschool care workers, anyone who is working with kids who has some issues and they weren’t sure how to approach them, I think that it’s a great vehicle and a great tool for them. HR: Well I found this book SOS: Save our Students, to be outstanding and inspirational, logical, and practical all wrapped into one. And we at DifferentBrains.com salute Lori Bitar for being a pioneer in the thought process for the educational needs of our kids, and Lori Bitar knows one size does not fit all. We’ve been so fortunate today to have as our guest on Exploring Different Brains Lori Bitar, the educational specialist consultant. 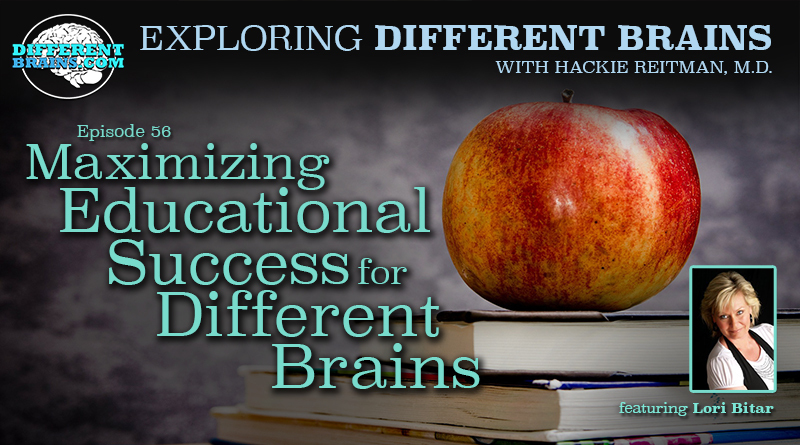 Well that’s it for another episode of Exploring Different Brains, I’m Dr. Hackie Reitman here at DifferentBrains.com and we’ve had the pleasure today of learning from Lori Bitar the educational consultant, the author of the book SOS: Save our students, the found of a charter school, and so much more. Lori it’s been an absolute pleasure to have you here and very enlightening as well. LB: Well thank you very much, I appreciate learning more about your team and all of your great work that you’re doing. 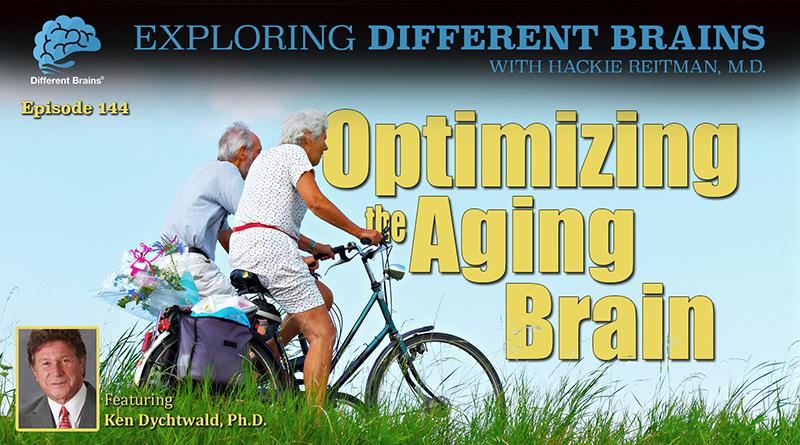 (27 minutes) In this episode, Dr. Hackie Reitman speaks with author, psychiatrist, gerontologist, and Age Wave CEO & Founder Ken Dychtwald, Ph.D. about maintaining brain health while aging.